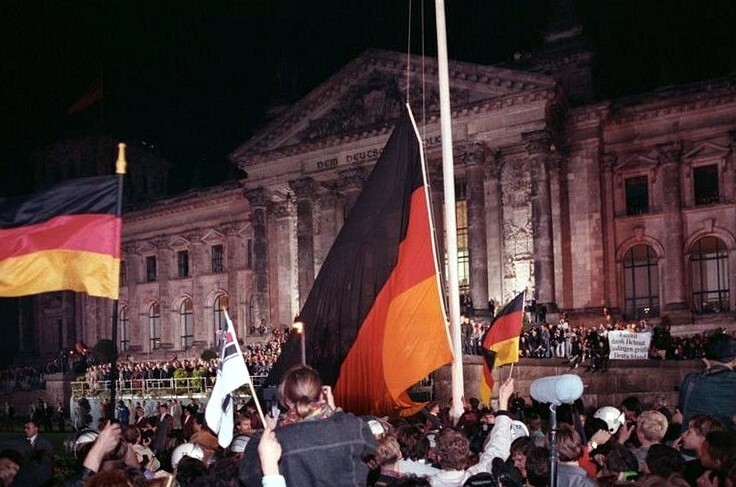 Germans in front of the Reichstag building in 1990, after the reunification of Germany. Photo via the German Federal Archive. The fall of the Berlin Wall in 1989 began a process that led to German reunification. On this date in 1990, an agreement was reached between the two Germanys and four outside powers, including the United States, on what that process would look like. In an editorial titled “The Newest Superpower” (March 12, 1990), The Nation feared the potential that a reunified Germany would be able to improperly throw its weight around in Europe, as, in fact, it has done. It’s true that there is no stopping German unification, nor should there be. Germans, no less than Lithuanians, South Africans, Palestinians or Quebecois, have a right to political and social self-determination that is based on international law and equity. But an increasingly interdependent, and vulnerable, world community has the responsibility to see that the process of self-determination is as free and fair as possible, and that the consequences do not imperil the peace. Those duties are political in nature, and usually highly ambiguous. One person’s “free and fair” formula is another’s stacked deck, and peace is always conditional. In the case of the two Germanys, self-determination is likely to lead to the creation of a bona fide superpower with the ability, and maybe the will, to throw its weight around in a way that deprives others of fully autonomous self-rule. That is what superpowers do, whether they are American, Soviet or, in the old days, British, French or Dutch. It’s bigoted to believe that the Germans, because of some volkisch character quirk, are more prone to the abuse of super power than anyone else. History holds too many nightmares all around. But it is only realistic, and now imperative, for those who still have some say in the matter to devise democratic structures that may keep new superpowers in check. Imagine how much better the world would be if the United States had been more bridled in its arrogant exploitation of power for the past forty-five years. President Gorbachev has the right idea with his plan for an all-European effort to contain the Continent’s nascent titan. Such a project must entail the transformation of NATO and the Warsaw Pact into a new community that will protect boundaries, safeguard minorities and vanquish fears of any bully on the block.